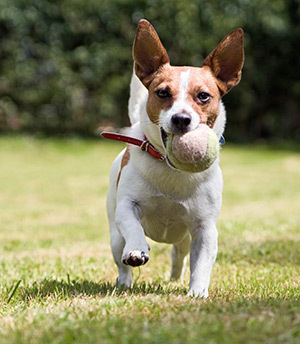 Our experience shows a strong correlation between a high level of activity and a happier, healthier pet–especially while they’re away from home at our luxury dog boarding facility here in Rockville. We have a wide menus of favorite activities and interaction that every pet parent can select when choosing boarding at Pet Dominion in Rockville, MD. Discounted Dog Boarding Activity Packages are available which feature some of our most popular services.We will discuss these with you when we learn more about your pet. Guests can enjoy Individual or group play sessions up to three times a day. 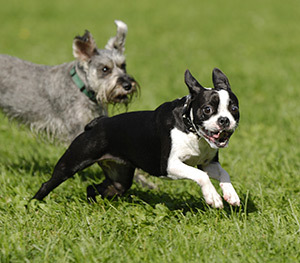 Our highly-trained staff supervise small groups of dogs with plenty of personal attention in our play yards which feature playground equipment and plush artificial dog grass. Some dogs need a few extra trips outside to use the bathroom. Our extra business walks are great for these special friends because they are offered up to three times a day in addition to the three business walks included in your pet’s stay. Your dog will enjoy the extra time outside with our caring staff and feel more comfortable inside with an empty bladder. These seasonal and delicious treats are homemade here at Pet Dominion. Developed by our medical director, Dr. Michael Bassett, these yummy snacks will have your dog’s mouth watering and tail wagging for more! Many of us like to unwind at the end of the day with a good book, so why shouldn’t your dog? Just like at home, our loving staff will provide personal attention while reading one of our hand-picked dog books before saying goodnight. 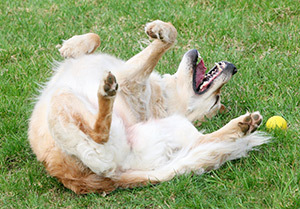 These one-on-one sessions are a great way for your dog to end a busy, fun-filled day. Just like at home, our caring staff will spend personal time with your pet before “tucking” him/her in for the night. I've been going to Pet Dominion for over 20 years & I wholeheartedly recommend them to anyone looking for a quality place where they offer the best medical care and love your furry family members just about as much as you do. Come rain or shine, 365 days per year, we always have staff here caring for our furry guests. However, during select holidays we give our front desk staff time off to be with their families. Therefore, our lobby is closed for the following holidays: New Year's Day, Easter Sunday, Memorial Day, July 4th, Labor Day, Thanksgiving Day and Christmas Day.